Whether you're a professional athlete or general fitness enthusiast, wouldn't you prefer a workout that's kinder to your joints while also producing amazing results? 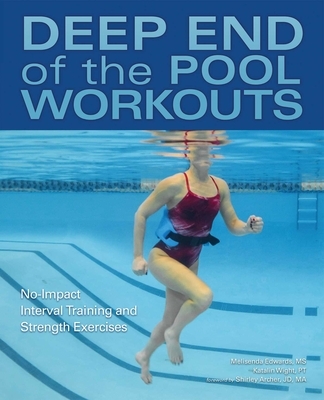 Thanks to the higher force required to move your body against water's resistance and the absence of any impact during the exercises, the workouts in this book do just that. Melisenda "Melis" Edwards, M.S. is a running and triathlon coach, personal trainer, fitness instructor and most importantly, an athlete. Having participated in sports ranging from ironman distance triathlons to ultra-running (including Western States 100), she understands the demands athleticism has on the body. With this knowledge, Melis has used the pool to work with athletes from triathletes to professional hockey players, for training as well as rehabilitation. She holds a master's degree in health promotion and certifications with A.C.S.M., as well as countless others. Melis knows what it's like to train non-professionally hours a week, work full-time, all while still trying to have a "life." Katalin Wight is a Physical Therapist who has been working in the field since 1993 when she graduated with a Masters Degree in Physical Therapy from the University of California, San Francisco. Kat's specialty is in the acute care field. She has participated in organized sports beginning in her high school years, into college at SDSU, and recreationally. She has continued to stay active in a variety of sports including hiking and running. Being an active person all her life and having a background in Physical Therapy, in body function as well as dys-function, Kat brings a keen eye to the overall description of the movements and another experienced perspective on the techniques and methods Melis has developed. Her areas of interest and aptitude naturally dovetail with Melis' unmatched skills and vast experience in deep water training and fitness in general.